My last few loaves have all been variations on a simple recipe I threw together for a fruit loaf. It’s mixed & kneaded by machine (bread hook in a Kenwood Chef standing mixer), with a little hand kneading to finish and proofed in an oven warmed to 50C and then cooled to about 25-30C. Whisk together until well combined in the mixer bowl and allow it to sit for 10 minutes or so (should be quite frothy after that). Then add 2 cups of plain flour (or one cup plain flour, one cup wholemeal flour (or rye, or barley, etc)) and 1 Tablespoon of salt. At this stage you can through in any variety of additives (eg sunflower seeds + poppy seeds + pumpkin seeds or (cinnamon, nutmeg, allspice & cloves) + sultanas + currants or like last night toasted pine nuts and dried pineapple pieces). Mix on low until the dough forms and starts to pull away from the edges of the bowl. Now add some extra flour (a couple of Tablespoons) and mix again. Repeat until the dough is just moist but not sticky (you’ll need to remove the dough from the hook every now and then to test it and allow it to absorb more flour). Then machine knead for a minute or two. Remove and hand knead until very springy. Place in a lightly greased bowl, turn once to grease the top of the dough ball, then cover with a tea towel and place in the warm oven to rise (or if it’s not winter, leave it on the bench). Within an hour it should have doubled in bulk. Tip the dough out onto a floured surface, then hand knead again until springy. Form into the desired shape and place in/on your baking implement of choice (I use a 680g bread tin). If using a bread tin, press the dough into the tin, especially in the middle. Oh, and “grease” your tin with flour. Cover with a tea towel and return to the warmish oven to proof for about another hour (possibly less, I usually forget to check the time). Remove when doubled in size or the dough protrudes from the tin the desired amount. Warm the oven to 190C and then bake the loaf for 35 to 40 minutes. So far I’ve made two different fruit loaves, a wholemeal seed loaf and not a nut/pineapple loaf all using the same recipe. 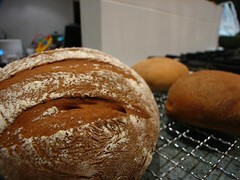 The bread is light, but with a good texture, and more importantly, consistent between bakings.